While some innovators are known for engineering excellence for a particular series, Sid Waterman is one of the few whose product innovation crosses almost all race boundaries. For over fifty years, Waterman has been at the forefront of engine and fuel system component innovation Drag, Midgets, Sprint, Late Model, Indy Car, and Off-road. With offices in Indiana, North Carolina and California, he has been poised to serve his customers with the tech advice they need to compete and win. Originally from California, Waterman cut his teeth learning to race at the Freemont Drag Strip driving a 1955 MG equipped with a small block Chevrolet engine. 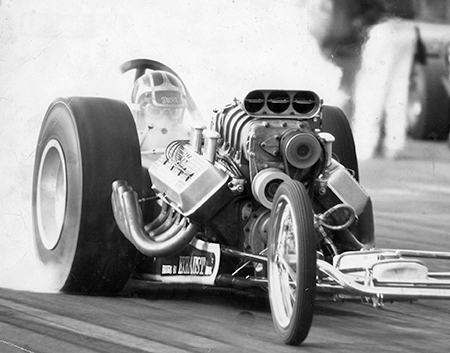 Though he eventually built and drove his own Top Fuel car, his passion was in building and tuning cars and he became a crew member for the Masters & Richter Top Fuel Dragster. In the late ‘60s he began working with Mickey Thompson and launched his first engine building business – Waterman Racing Engines. It was from the likes of Don Garlits, Shirley Muldowney and Bob Glidden among other racing champions that Waterman knew how to build engines to win. From building engines to developing aluminum connecting rods to the development of high quality fuel pumps and fuel system components, Waterman Racing is today best known for its fuel pumps. After selling the engine building portion of his business in ’79, he set up a shop to concentrate solely on fuel pumps. Out of the gate, they were a huge success as his first pumps delivered to Billy Meyer and Gary Beck won at Baylands Racing with record elapsed times. One of Waterman’s more common-sense innovations was the practice of making both the pump housing and the pump rotor of the same material, in this case aluminum, so that during operation heat expansion would be the same for both components; maintaining critical clearances and consistency throughout the entire race. During his lengthy career, Waterman has received the Car Craft Magazine All Star Drag Racing Team “Engine Builder of the Year” award and the Car Craft Magazine All Star Drag Racing Team “Special Manufacturer’s Award” for fuel pump development, in addition to a special manufacturer’s award for his supercharged burst panel. In 2004, Waterman was honored by USAC with the prestigious CNA Jack O’Neil Award for significant contributions to auto racing safety. Few realize that every winner of the Indianapolis 500 for the last thirty years has been equipped with a Waterman fuel pump and the vast majority of competitors in Top Fuel and Funny Car today utilize the increasingly popular WRC Gold fuel pumps. WRC pumps were recently used on 146 of 150 entries at the Knoxville Nationals and are being heavily used in both the NASCAR Busch and Craftsman Truck Series. In December 2016, Aeromotive announced a joint venture with Waterman Racing at the 2016 PRI Show. The announcement brought together two powerhouses, both highly recognized in the racing industry with unique strengths, to build on the legacy of Waterman Racing fuel delivery system and component manufacturing. Aeromotive with its focus on aerospace technology, processes and materials and family race history combined with Waterman’s fifty year racing and engineering legacy, depth of sales and service with three locations ensures that the best of both companies can meet the challenge of racing to win well into the future.